Why help us pay off our building? Day One of Greater Altoona is a niche ministry on the front lines. (body, mind, soul) and the whole family. It's truly amazing what happens when you are willing to walk with someone as they face the worst life throws at them offering the hope of Jesus Christ along the way. Lives are transformed, and souls are saved in the name of Jesus Christ. 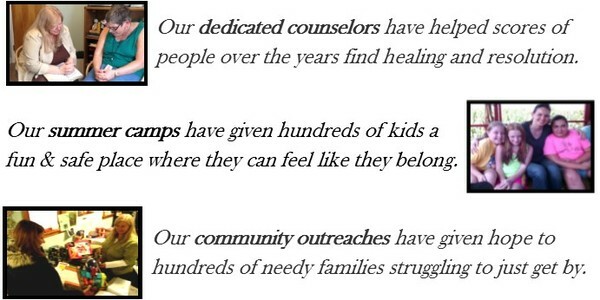 *Does this sound like a ministry you would support? Just imagine the impact in our community if Day One was debt free...  How many more people could we help in the name of Jesus Christ? one time donation of $5, $10, $25, $50 or more. *Online donations available at www.dayoneministries.org. Day One of Greater Altoona is a 501(c)3 Non Profit so any donation is tax deductible. 100% of the donated amount goes toward the principal balance on the mortgage of our office building. Any donation online is safe and secure via wepay or paypal. You can also mail a check written out to "Day One of Greater Altoona" and send to the address listed below. What is Day One of Greater Altoona?